The new-generation BMW X3 now gets a petrol engine that produces 252 bhp and 350 Nm torque, and is being offered with BMW's Luxury Line level of equipment. BMW India has added a petrol variant to its new generation BMW X3 portfolio in India. The BMW X3 xDrive30i is powered by a 2-litre, 4-cylinder twin-turbocharged petrol engine that produces 252 bhp and 350 Nm torque, and joins the Expedition and Luxury Line trim levels on offer with the 2018 BMW X3's diesel-powered variants. The petrol variant is priced at Rs. 56,90,000 (ex-showroom, pan-India), and is available for orders across all BMW showrooms in India from today. 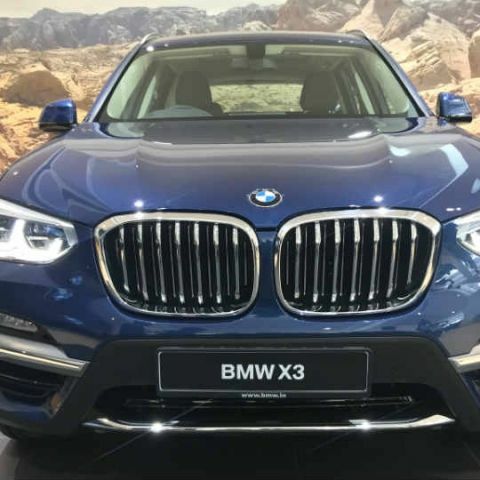 The BMW X3 xDrive30i maintains the same level of equipment that we have already seen in the xDrive20d variant, pairing the petrol engine with the 8-speed automatic transmission and paddle shifters. The array of technology and electronics onboard the new generation BMW X3 include the 10.3-inch iDrive infotainment system, a 12.3-inch semi-digital instrument cluster, iDrive controller with handwriting recognition, 600W Harman/Kardon audio system, six-colour ambient LED lighting, rear view camera with parking assist and dynamic guides, wireless smartphone charging and the BMW Display Key (without remote park-in/out). Mechanical electronic elements in the car include electronic power steering, four electronically-controlled drive modes, brake energy regeneration, adaptive suspension, automatic differential brakes, dynamic traction control, dynamic stability control, cornering brake control, auto-hold electric park brake, hill-start/descent assist and something called 'driver attentiveness alert'. You also get adaptive LED headlamps and LED tail lamps, as well as LED fog lamps. With the addition of the petrol engine, BMW has diversified its mid-range SUV portfolio in a bid to take on the likes of the Audi Q5, Volvo XC60, Mercedes-Benz GLE and the Jaguar F-Pace. For more details about the new, third-generation 2018 BMW X3, click here.